I read Romans 8 in my quiet time this morning. And prayed. I’ve been praying for you for some time now. In more ways than I could ever share in just this note. You’ve had a handful of other Godly men praying for you for over a month now. An army of believers has prayed for you…and today I write this and etch into history the account of how those prayers have been answered. “I ‘axeded’ Jesus into my heart.” Heart knowledge…you first received it that day over a month ago. As I mentioned earlier, I’d been praying for your faith to grow to the point of understanding and acceptance of the free gift of salvation through Christ for long before this moment. Now, as your heart became filled with the Spirit of God, it became time to begin praying for the understanding of what that means for your life and how to apply it. Over the course of a month of more in depth conversations…lots of questions. You’re so analytical and inquisitive. Finding ways to explain it in ways you can understand was a fun challenge. And then it finally sunk in. God answers prayers son. You are evidence of that truth. You are, now, not only my son, but now also my brother! My brother in Christ. My fellow co-heir to God’s glory! We have a date with eternity, you and I, that can never be snatched from us. I’m going to “carry my cross” (Luke 9:23) and embrace my responsibility to live my life raising you as my son, and I’ll see you in heaven brother! I’m reading through Exodus this month, and although I’m pretty familiar with the stories, something stuck out this morning that I had not known before now. 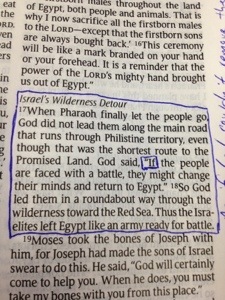 I knew that God led the people of Israel through the wilderness rather than a more direct route out of Egypt. And I knew He took them that way so that His glory would be known through the parting of the Red Sea. But one word hit me like a rock this morning. Did you see it there in the picture above? No? look again. And that one word changes everything. This is the God of miracles! The God of Abraham. The God who raises the dead and commands every living thing. The God who delivered Jonah via a whale! The God who breathed the world into existence and numbered the stars! Here, He’s brought His people out of Egypt and is directing their path with a pillar of cloud and fire! He’s getting ready to part the Red Sea for crying out loud! And here He says, “If the people are faced with a battle, they might change their minds and return to Egypt.” Really? I get that the Israelites were slaves for hundreds of years and not ready for battle, but you mean to tell me He can’t lead them through the wilderness while simultaneously clearing the wilderness of all potential enemies? That’s the thing with God. He doesn’t want us to be stuck on the things we can’t understand. There are just some things we’ll never know. Reasons for Him leading us down a particular path that we’ll never understand on this side of eternity, if ever at all. Reasons unknown to us for putting a road block in our path that force us to change paths. Do you dwell on the what if’s? What if I’d gotten that job? What if my wife hadn’t left me? What if I’d been a more involved father when they were young? What if I’d turned left instead of right? What if…if only. Yeah, I struggle with that sometimes too. We’re human after all. What if instead we recognize what we should be recognizing. That God is God, and we are not. Because knowing the reason for the “if” changes everything, and the knowledge that comes with that…I could not handle.